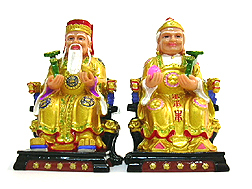 Choy San Poh can be considered as Goddess of Windfall and especially beneficial for speculative luck. She wears the lucky gold robe designed with auspicious symbols. Her extremely smiley gesture ensures invitation of money into your homes and business premises. This item will definitely be important for those seeking to multiply their wealth abundantly, by magnifying their speculative affairs such as lotteries, 4-digits, football bets, horse racing and the stock market. Having her presence at home is especially crucial for those who want excellent windfall and gambling luck. You may display this Goddess of Windfall together with the lock-coin in the southeast sector to bring you excessive extra-income. For those who make speculative investments through stocks, her presence will bless you with all the right decisions. The Goddess of Windfall is also a good representative of the Matriarch, providing excellent family blessings to kids and women especially. What Goddess of Windfall symbolizes and how to place this deity? The Goddess of Windfall traditionally is known as the wife of the Earth Wealth God. She has the special duty to help people become rich because of her role to help her husband distribute wealth to the people, and also in gaining windfall luck and gambling luck. She brings quick prosperity (a lot of gains from money perspective) and good fortune to all households and businesses. She is a powerful symbol of the martriarch and also plays a major role to help housewives and children of all families. 1. To magnify your windfall and speculative luck in life, place the Goddess in your sheng chi direction, SE universal wealth corner and water star-8 location in your home or workplace. 2 . Display the Goddess of Windfall in your living or family rooms, business premises and offices, especially in southeast corner (wealth corner) to activate and enhance your wealth luck. 3. Display the Goddess of Windfall facing your entrance so that you can see him as you enter to invite wealth and multiple fortune luck into your homes at chi entry points. She will help transform all forms of chi to become prosperity chi. 4. Display the Goddess of Windfall in your office and shops to ring in more sales and achieve more monetary gains and successes. 5. Display the Goddess of Windfall in the Northwest sector to activate your financial support luck for money finding opportunities. 6. The Goddess of Windfall image is a must for tycoons and for those doing any kind of business seeking for success. The symbols sends vibes to our minds to remind us of money seeking opportunities. 7. Displaying the Goddess of Windfall in the southwest will enhance martriarch luck besides improving wealth of the family.